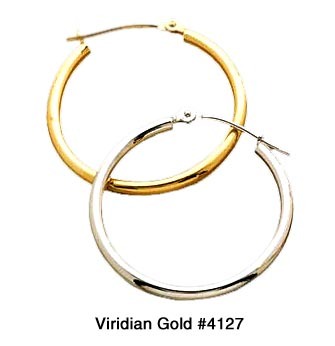 We are constantly updating our inventory at Viridian Gold, and we have recently added some new huggies, hoops, dangles, studs and earring jackets to our extensive earring selection. You may be thinking, "that's a lot of terminology for a simple pair of earrings." Add the type of closure, and the terminology becomes even more confusing! In this blog, we'll attempt to clarify information about hoop and huggie earrings. Hoop earrings can be round, square, oval, big or small, heavy or lightweight. Whatever style you like, comfort will depend on the weight and type of closure. 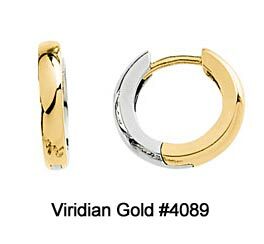 Some customers like hinged earrings, such as our #4089 pictured on the left. 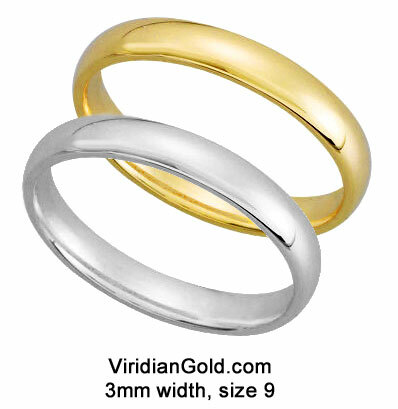 This particular pair measures 2.5mm in width and weighs only 2.25 grams/pair. Easy to open and close, a small latch inside the earring top catches the post, securing it in place. Huggie earrings, like the one above, do just what their name suggests ~ they hug the ear lobe, and because they are shorter, their weight is less noticeable. What's the difference between a small hoop earring and a huggie? Sometimes, nothing, although some of our smaller hoops are slightly longer than most of our huggies. Take, for example, Hinged Hoop Earrings #4136. Measuring 16.5mm in length (an approximate 5/8") by 4.3mm width, they weigh 4.51grams/pair (weight determined by the length, width, and thickness). Continuous hoop earrings, such as #4133, don't have a noticeable closure - the post slides into the hoop end, which is hollow, giving a seamless appearance. Hollow earrings weigh less than solid ones, and are thus comfortable to wear in larger sizes. Our #4127 are created with small, 14K round hollow tubes, and are available in white or yellow gold, as well as in seven sizes ~ from 15mm (9/16") to 47.5mm (1-7/8"). These are secured with snap post closures, V-shaped latches that the posts snap into. The weight ranges from 1.00 gram/pair for (15mm) to 2.90 grams/pair (47.5mm) ~ comfort in whatever size you choose. 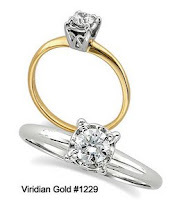 For more information, see Earring Closures, and be sure to check our extensive Earring Selection for that perfect pair.